I love the sun! And living in a town with SO MUCH to do outside in the summer, it may be difficult to considor Wimberley a fall or winter destination…but since my husband loves cooler weather we’ve figured out several things we can do together – both inside and out – when the temps dip below the 50’s. (I considor that extreme winter). If you are planning a romantic getaway and are thinking about the Hill Country, check out this list of things to do in Wimberley. And don’t forget to book a cozy cabin if you can! Guys – there are some pretty cool spots on this list – including a few spots where popping a ring out would be a total hit! One of the things Wimberley is most well known for is it’s amazing shops, galleries and restaurants downtown. During the fall the shops and entire square are fully decorated in the Christmas Sprit with beautiful greenery, lights and other holiday displays. Luckily it’s pretty rare for the temps to be so low that you can’t enjoy a walk through town. Head to SIP! one of our local coffee shops and grab a seasonal latte and homemade muffin or breakfast taco. If you want a full breakfast, The Wimberley Cafe next door has an amazing breakfast. Even if you don’t like to shop there are some great spots to stop and enjoy. Several art galleries on the square and right off the square in Old Towne Plaza are worth a tour just to experience the paintings, sculptures, and photography of local artists. 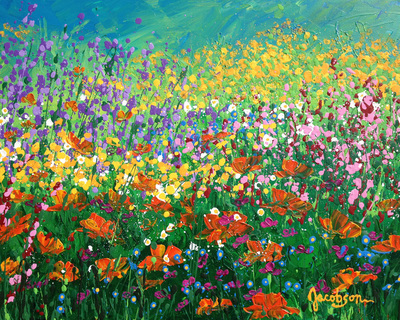 One of my favorites, The Wildflower Gallery has a beautiful display of Texas Wildflower paintings and gifts! If you stop in be sure and tell the gallery manager, David, that Jodi said hi! 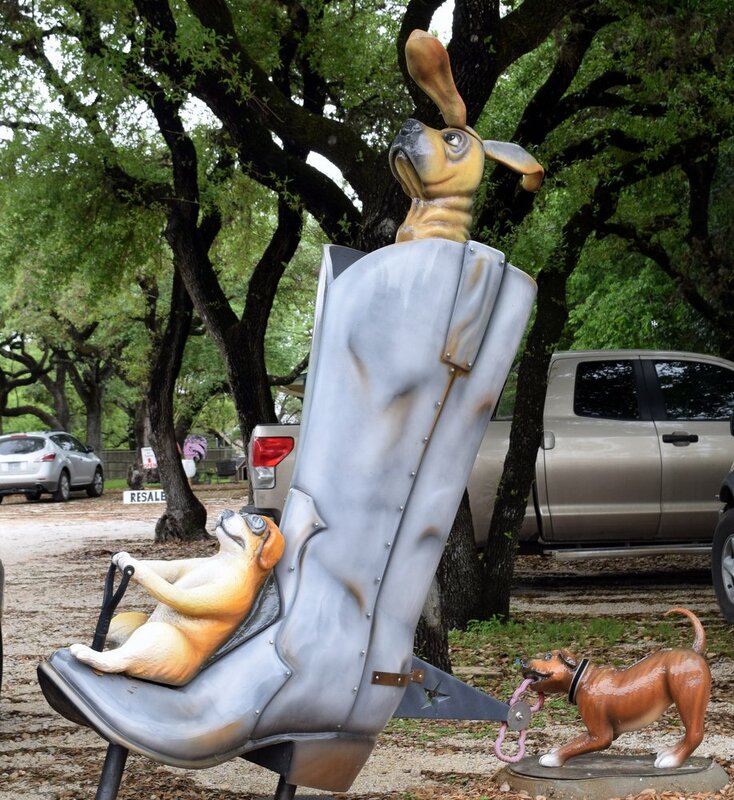 You will also see many of the boots that make up the “Bootiful Wimberley” art tour. Locals and visitors alike enjoy taking selfies with the boots. Be sure and post yours on our Facebook or Tag us on Instagram! Of course, there are also some unique shops downtown – a few of my favorites right now are Broadway Pauls Collectibles (vintage collectibles, old records, and much more), The Hill Country Wine Shoppe with some unique Texas wines and wine-lover gifts, and Papa Hoos Popcorn! Wimberley Glassworks is one of my favorite places in Wimberley to take new visitors and was the highlight of the first Wimberley date my husband and I had a few years ago. Here you can watch a live demonstration of how they make their beautiful glass vases, light fixtures, glassware and art. Tim, the owner and artist, creates a beautiful piece of glass right in front of you while explaining how to achieve all the shapes and color techniques of his art. Because the glass blowing demonstration is held in a warm (from the fire they use to blow glass) and cozy room, it is a perfect spot to get out of the cold. Be sure and check their website for dates and times for demonstrations- they also have glass blowing classes throughout the winter which is sure to be fun! There’s several great restaurants in town with an amazing selection, but if you are looking for an amazing lunch in a more elegant spot, I highly recommend The Leaning Pear. The fresh-ingredient menu from owner and chef Matthew Buchanan gives you plenty of choices for a cozy and eclectic hill country lunch or dinner. For traditionalists, try the amazing Macaroni and Cheese!! 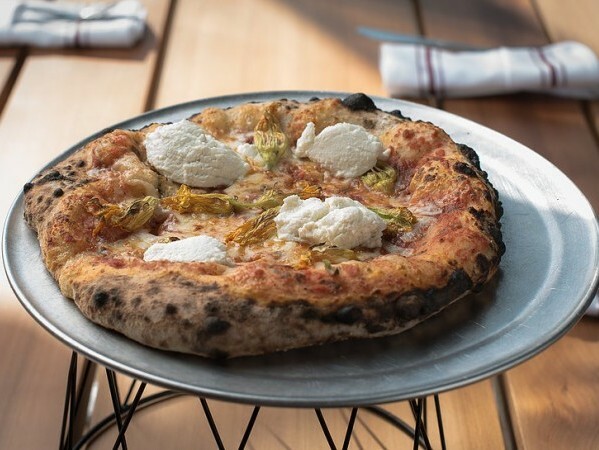 Other top choices are the wood-fired pizzas – like the sausage and mushroom made with homemade Italian sausage and fontina cheese. Cozy soups are made daily and they have a great selection of craft beers and hill country wines. Get there early or make a reservation for a spot by the large brick fireplace in the back! Perfect for a chilly day. Nothing warms up the body better than exercise and the “back” trails at Blue Hole are challenging enough to keep you cozy. With about six total miles of trails you will climb up rocky hills, hop over trickling creeks and experience one of the most beautiful spots in the Hill Country. If you are adventurous, grab a blanket and a bottle of wine and hike over to the Blue Hole Overlook Trail to a rock patio that overlooks the creek. Watch the birds and deer and listen to the sounds of nature. You probably won’t see a soul for hours. There are so many to choose from and you will definitely have a full day of fun if you visit a few of these places. I wrote an entire blog post about them: Top Shelf Wimberley – Top Spots to Get a Drink, Beer or Glass of Wine!. For theater lovers, the Wimberley Community Theater “The Wimberley Players” is regionally recognized as one of the best. The playhouse usually has shows every evening and a Sunday matinee during each of its mini seasons and has plays throughout the year. Lots of little towns have community theaters, but not many of them have productions honored by BroadwayWorld Austin. Last year, the Wimberley Players racked up 12 awards for best musical, best actor, best director and more. The plays are getting popular with theater-goers in the area so it can be hard to get tickets, but you can always call and get on the waiting list. This is definitely an evening out you should plan in advance but if you like theater it really can’t be beat. It’s no surprise that an area as beautiful as Wimberley has one of the most romantic Bed & Breakfasts in the state. The Blair House Inn, well known for it’s seasonal gourmet dinners and cooking school retreats is a an amazing destination for a romantic getaway. Book one of their 12 secluded rooms on 22 tranquil acres. For those looking to spend some relaxing couple’s time, make a reservation at their luxurious Day Spa – with a selection of a a number of different massages to choose from, you will leave feeling relaxed and rejuvenaed. One of the most romantic spots in the area is Trattoria Lisina in Driftwood, about 10 miles from Wimberley. This Tuscan Style Italian Restaurant is known as one of the top romantic dining spots in the Austin area. Trattoria Lisina is set on a large winery estate and has fresh pastas, veal and lamb dishes, amazing desserts and a wonderful selection of regional and Italian wines. If you are headed here on a weekend, be sure and get a reservation. Get more details including links to their full menu here. There are lots of adorable little cabins and cottages around town but one of my favorites is The Cottages At Canyon Peaks located a few miles out on the Devil’s Backbone Highway (hwy 32), one of the most beautiful drives in the Texas Hill Country. Imagine how romantic it would be sipping some Hill Country Wine beside a cozy fire. These adorable little cabins are designed with refurbished architectural details including shiplap, vintage windows and flooring, and upcycled furnishings and refinished antiques. It is a perfect inspiration for your JoAnna Gaines decorating. The owners, Sherry and Gary, are sweethearts and will let you roam their piece of the hill country to see some of the amazing views. Their place is perfectly located near Gruene (dancing, music and dining), The Guadalupe River and Canyon Lake (boating, kayaking, hiking) and of course, Wimberley! Reading back over this list I can see that I probably gave you about three days worth of fun; let me know in the comments if you plan to visit any of these spots or if you did, what did you think? Better yet, if you are planning a Wimberley vacation and want some help with your own romantic trip just hit us up in the comments for even more suggestions, or join our email list to keep up with everything going on in town! Thank you for posting this! My husband and I are new parents and are headed to Wimberly next Friday for our 5 year wedding anniversary and the first time being without our little girl. We are doing a full day Friday and probably leave late afternoon on Saturday. We will probably catch breakfast in Austin since that’s where we are coming from but there seems to be so many fun things to do. Honestly we were going to go to Fredericksburg because we were used to the wine tour on the way and the outdoor beirgarten with live music in the evening is one of our favorite spots. Do you recommend a local winery with tours as well as a place with daytime or evening live music? Thanks again for posting this!